Since the women’s book is actually nearing completion (I’m about halfway through editing the final draft), I figured it was time to post up another excerpt. This is from Chapter 18 on Goal Setting and deals with women’s maximum muscular potential in terms of how much lean body mass (LBM)/muscle they might carry. Martin Berkhan’s model was the only that really addressed maximum potential (based on height) and while he has updated it recently, he did not present data for women due to a lack of an adequate sample size. And that is the topic that this excerpt addresses: a woman’s maximum potential LBM/muscle mass. 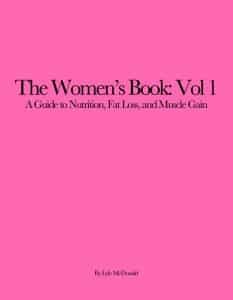 While the goal of gaining (or at least maintaining) LBM is an important one for all women, many readers of this book may only be interested in gaining relatively small amounts without huge consideration for the total amount that is or has been gained. The combination of proper resistance training with some basic changes in diet generally accomplishes this without difficulty or attention to many specifics. For that reason, this section will be aimed at those women who are deliberately trying to gain muscle. This could be the serious trainee simply trying to improve appearance, the physique athlete looking to optimize their physique for competition or the performance athlete attempting to gain muscle for performance reasons. In some cases, this might represent a relatively small amounts of muscle gain while in others, the goal might be to gain the maximum amount of muscle possible. Unfortunately, I can’t provide recommendations here on how much muscle should necessarily be gained in every situation since it is so variable. Rather, I want to focus on two more inter-related issues which are the maximum amount of muscle that can be gained along with the speed with which it might be gained (this is required to determine the size of the surplus). I addressed the second in the last chapter in terms of monthly goal weight increases relative to the number of years of proper training. This interacts with maximum potential. The further a woman is from her maximum the faster she can gain and vice versa. So what is the maximum amount of LBM (here I am talking about total LBM, not just muscle) that a woman might carry? A variety of studies have examined this in different types of athletes, finding LBM in the realm of of 125-140 pounds (56.8-63.6 kg) for women weighing between 144 and 165 lb (1,2). None of these studies were on competitive bodybuilders, who’s aim is to maximize muscle mass, and it’s conceivable that higher levels of LBM would be seen given that the sport is geared towards maximizing muscle size. One study compared female powerlifters to bodybuilders, finding that the powerlifters had 119 lbs (54kg) and the bodybuilders 108 lbs (49 kg) of LBM (3). Another compared female bodybuilders to athletic females, finding that the bodybuilders had 119 lbs LBM (54kg) while the athletic females only carried 99 lbs (45 kg) of LBM (4). It is somewhat surprising that the powerlifters and bodybuilders in these two studies have LBM levels that are below those seen in other sports. I have no real explanation for this although the lower LBM values are from relatively older studies while the higher values are from more recent work. A larger talent pool along with better training and nutrition might be contributing to these results. In that vein, looking at online competition results, a recent Natural Superheavyweight female bodybuilding world champion weighed 130 lbs (59 kg) on the day of her competition. Assuming she competed at 10% body fat, that would put her at 13 lbs of fat and 117 lbs of LBM (identical to this book’s sample dieter). Bodybuilders are typically somewhat dehydrated on the day of a competition and, if she lost some LBM during her diet, her off season LBM might be as high as 125-130 pounds (56.8-59kg), similar to the other values above. In general, taller and/or heavier women may be able to carry more LBM. In a study referenced above on elite athletes, an LBM of 154 lbs (70 kg) was recorded in a 200 lb (90 kg) athlete who was most likely a superheavyweight weightlifter or thrower (some of this LBM represents increased water, glycogen and connective tissue). Height is also a factor and tends to show a relatively strong relationship with the total amount of LBM that is seen in female athletes. One early study comparing female and male bodybuilders found that the females had a 1.73 lbs/inch (0.31 kg/cm) ratio of LBM to height (5). 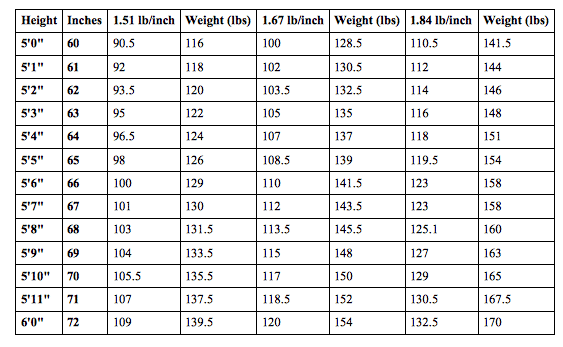 So a 5’5″ (65 inch/167 cm) female might realistically carry 114 lbs of LBM, well below the values listed above. Another study, looking at athletes from different sports found an average value for female athletes of 1.51-1.84 lb/inch (0.27-0.33 kg/cm) of LBM (6). It also identified several extreme outliers, six women exceeding 132 lbs (60kg) of LBM with one reaching 180 lbs (82.1 kg) of LBM at a bodyweight of 215 lbs (98 kg) at a height of 6’2″ (188 cm). This yielded a value of 2.45 lb/inch (0.44 kg/cm) of LBM which they suggested as a theoretical maximum value for female athletes. This was actually close to values for the lighter males and I have to see it as an outlier (or an indication of steroid use) rather than any sort of realistic goal. With that in mind, I have calculated the potential amounts of LBM that women of different heights might carry based on the more realistic values in the chart below. To put this in more real world terms, I’ve also shown what their total bodyweight would be assuming 22% body fat. Simply to make the point, using the theoretical maximum value, a 5’7″ woman would have 164 lbs LBM, 41 lbs more than the high average value above and simply an unrealistic goal for almost all women. The top professional female bodybuilder competes with 141-149 lbs LBM at 5’7″ and this is a sport marked by steroid abuse. Height in cm should be divided by 2.54 to get height in inches. LBM/Weight in pounds should be divided by 2.2 to get weight in kg. At any given height it’s fairly clear that women may vary significantly in the maximum amount of LBM that they might realistically be able to carry. This is going to be related to genetics and overall hormone levels with women having elevated levels of testosterone being far more likely to be at the higher levels of LBM relative to their height than those without. This is consistent with the finding that women with PCOS/hyperandrogenism are found in large percentages of high level sport, their hormones giving them a competition advantage. To the above maximum values, I would add that most women will be very close to their genetic limits after perhaps 3-4 years of proper training. Beyond that point, gains in muscle mass will be slow to the point of being almost insignificant. All of this information can be used to determine how much more potential muscle mass might be gained going forwards and it’s important to be realistic here in terms of what is possible. The 1.84 lb/inch value for maximum muscle mass is likely to hold for the majority of women and some will not even reach that level. A woman who has been training properly for 2-3 years who is between the first and second columns above may have the potential to achieve the second column with another year or two of intense training but she will be unlikely to come close to the third column. In contrast, a woman who has surpassed the middle level by her second year of proper training is likely to reach or at least get close to the third column in terms of her maximum LBM. This can be used to determine what level of surplus should actually be used. If a trainee determines that she only has the potential to gain 5 more pounds of LBM, she might target as little as 1/2 pound of LBM per month. Alternately she could look at the number of years she has been properly training and aim for a percentage bodyweight increase per month. In either case the surplus would be calculated as per the last chapter. 1. Healy ML et. al. Endocrine profiles in 693 elite athletes in the postcompetition setting. Clin Endocrinol (Oxf). 2014 Aug;81(2):294-305. 3. Johnson GO et. 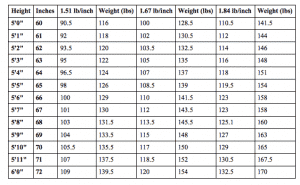 al.A physiological comparison of female body builders and power lifters. J Sports Med Phys Fitness. 1990 Dec;30(4):361-4. 4. van der Ploeg GE et. al. Body composition changes in female bodybuilders during preparation for competition. Eur J Clin Nutr. 2001 Apr;55(4):268-77. 5. Alway SE et. al. Contrasts in muscle and myofibers of elite male and female bodybuilders. J Appl Physiol (1985). 1989 Jul;67(1):24-31. 6. Abe T et. al. Gender differences in FFM accumulation and architectural characteristics of muscle. Med Sci Sports Exerc. 1998 Jul;30(7):1066-70.